Comments: Alyson Van Patten (Nee: Larkin) | Hayward CA United States | 1901-1920 | Comments: Woman on the left is Katherine Soffia Larkin Cassity Heyer (1862-1936). Her first husband was Dr.S.O. Cassity, who died. Her second husband was Charles W. Heyer, who was a County Supervisor in Hayward. 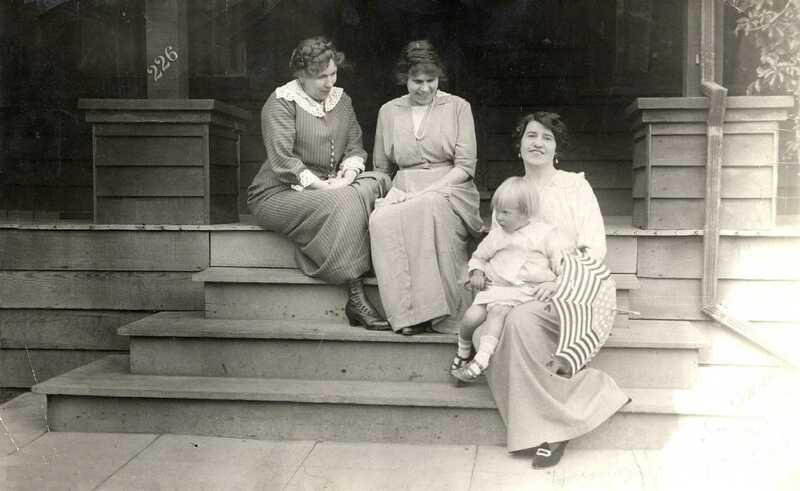 The woman in the middle is her nephew Mark Larkin's wife, Hazel Crow (1888-1991). The baby is her daughter, Alyson Larkin (also now deceased). Identification of these people was made by Alyson's brother, Wayne Larkin who died in 2003. The woman (nanny?) holding Alyson is unidentified. Wayne told me he thought this photo may have been taken in Berkeley.